Design a cabin to include extra room in the loft area, since this space is perfect for one or more bedrooms. Utilizing loft or attic space makes sense because the design does not necessarily require more building materials. Construction of the roof rafters and flooring of the ceiling rafters will support a loft room easily, if a detailed plan is adhered to. Always seek guidance from a building expert before actually starting construction of a cabin with a loft. Attic space in a cabin provides ideal room for sleeping or storage. Sketch a cabin design to include a roof having no less than a 45-degree pitch. Envision how the space might be used, so that heating and plumbing needs can be taken into consideration. Leave room in the design for stairs leading up to the loft. Consult with an expert carpenter on how to frame the staircase opening. Review home design books for cabins with open loft areas. Consult an architect to review plans that leave open walls visible from the floor below. Review the first-floor dimensions in the cabin floorplan. Decide where loft steps will be placed. Allow a staircase measuring at least 42 inches in width. Designate this width, if possible, to accommodate moving furniture pieces up and down. Design a balcony with all or part of the wall open to accentuate the loft area. Consider installing planks or exposed logs as the ceiling cover, if the loft is visible from other parts of the cabin. Plan to build ceiling rafters between floors with timbers 2-by-12-inches. Envision these floor joists as needed support for heavy plank flooring or large floor posts erected in the loft area. Use this 12-inch space to add extra insulation between floors as well. Review cabin construction sites to understand the value of insulation between floors, which first of all, ensures the cabin will be quieter. Install this insulation to retain fireplace heat longer on the first floor, too. Incorporate full logs as decorative floor-to-ceiling support posts in the loft area. Utilize logs to create trusses for the cabin as well. Create the trusses to serve as a practical means of holding up the roof, but design them to be viewed as part of the beauty of the cabin. Design the overall look of the cabin to include furniture made of logs. Create a view of the loft area, if it is primarily an open balcony, to include furnishings and artwork from below. Build a vanity area in the loft to include cabinetry that blends with the wood used in the cabin interior. Avoid furnishings or plumbing fixtures that stand out too much. 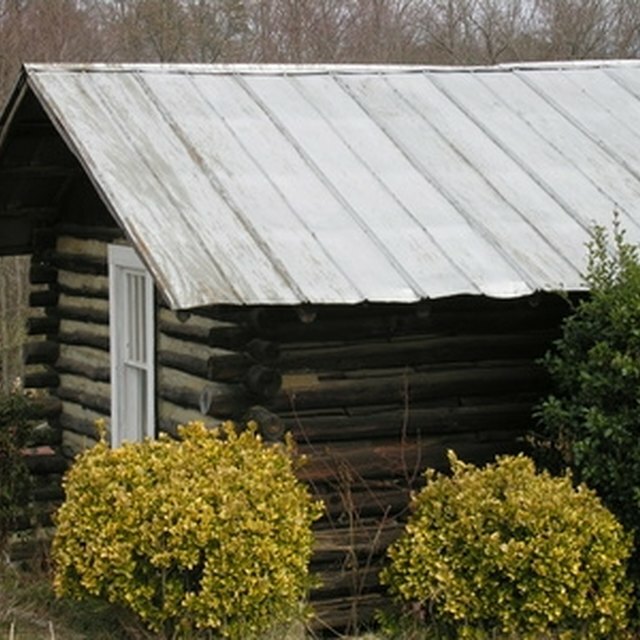 Utilize wood, tiles and any materials with a rustic look to give the cabin design a uniform look throughout. Educate yourself about cabin designs and options available. Create your loft design after visiting many websites to review overnight rental cabins in mountain areas, such as Gatlinburg, Tennessee, or Denver, Colorado. Photos are available for thousands of rental cabins, which includes video tours of interior spaces and lofts on these websites. Decide whether a balcony will interfere with privacy issues if the cabin will accommodate several people. Consider including closing doors over part of the balcony as an option. How Do I Convert a Hay Loft into a Room?